I am of the firm opinion that the zombie walk phenomenon is the best thing to ever happen to the world. I’m so glad that London has one every year now. I managed to make it out yesterday, albeit as a puny human and not a zombie. Here are some pictures. I love how every zombie had some twist or detail that made them unique. The girl above has a pencil sticking out of her neck, and that guy held the severed hand in his mouth the entire time. The makeup on the one above was amazing. 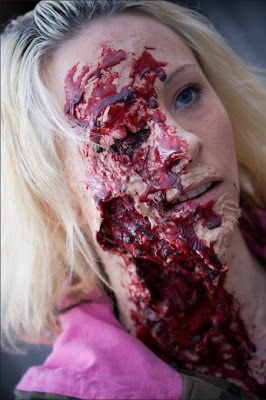 Every time I see a girl dressed as a zombie, part of me falls deeply in love. I’m not a photographer and my pictures aren’t the best. 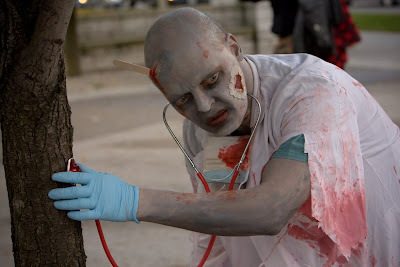 Check the London zombie walk’s official site and the event’s Facebook page for better professional-type pictures. I so wanna participate next year. 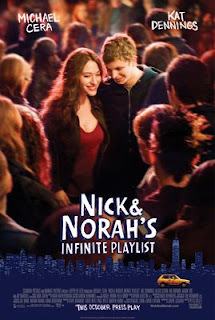 Ok so go read this review of Nick and Norah’s Infinite Playlist by critic Jordan Hiller and then come back here. The film and those like it are merely the reflection of ageing creative people in hopeless search for an elixir. I haven’t seen the movie, but I do find this review pretty ironic. Most of it attacks the movie because its portrayal of teenage life is not realistic, is just a cheap attempt by its creators to hold onto their own youth, and was created to tap into the conflict between youth and adulthood that everyone struggles with throughout their lives. The irony comes from the fact that the reviewer compares the movie with what I assume are the teen movies of his own youth in the 80s. Again, maybe the movie really is crap, but is comparing it unfavourably to one’s own favourite nostalgia-enhanced movies while at the same time dumping on nostalgia really a good way to criticize it? He does make a good point that movies are not realistic, and present an idealized reality that may only be an attempt to cash in on our obsession with youth. But is that a bad thing? Writers can deal with their own youth / responsibility struggles by creating fantasy, and people can relate with that fantasy when they see it put to film. The search for an elixir of life isn’t hopeless; we can take tiny sips of it for two hours at a time every time we watch a good movie. Michael Cera may play exactly the same character in every role he’s in, but he’s still awesome. I do not disagree that The Breakfast Club and Adventures in Babysitting are cinematic masterpieces.